I firmly believe that simple is best and that food, when not overly messed with, is both artful and most tasty. 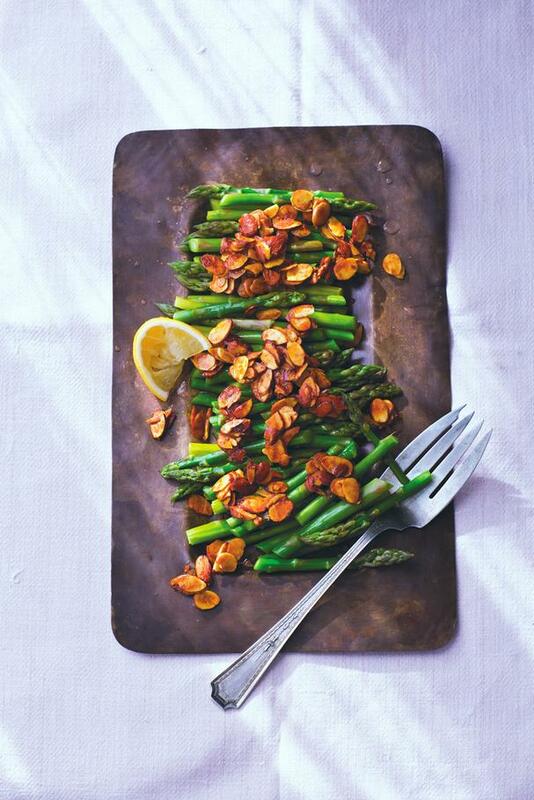 I love this seasonal asparagus dish from Veronica Bosgraaf (founder of the nutritious food company The Pure Bar) where springtime asparagus is lightly cooked then topped with toasted spiced almonds that are both sweet and savory. No fuss, just wholesome goodness. I think your family will love this dish, too. This recipe is from Veronica's new cookbook, The Pure Food Cookbook, where she features easy, clean and seasonal plant-based recipes the whole family will enjoy. Preheat the oven to 325°F. Grease a baking sheet with oil and set aside. Heat the oil in a large heavy skillet set over medium heat. Add the asparagus and cook, stirring frequently, until just tender, about 5 minutes. Transfer the asparagus to a serving dish. Sprinkle with the lemon juice and then the almond mixture.